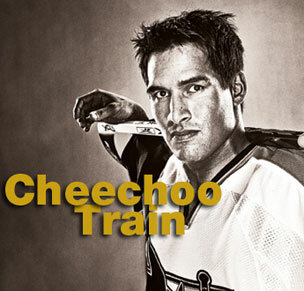 Dirty Dangle Hockey: Why Did the Cheechoo Train Fall Off the Tracks? Why Did the Cheechoo Train Fall Off the Tracks? Former 50 goal man Jonathan Cheechoo is still in his prime years of playing professional hockey. But instead of lacing it up in the NHL, he is playing for the Worcester Sharks of the AHL. Cheechoo has seen his goal production drop every year since he scored 56 goals and 93 points in the 2005-2006 hockey season. After that season his goal production has dropped to 37, 23, 12 and 5 last year in 61 games with the Ottawa Senators. What happened to those magic hands and that quick release? After his 56 goal Rocket Richard winning season he started to miss more time with injuries, but he still was playing close to 70 games a season. If this was baseball the first thing we would be thinking was that he scored 56 goals with a little extra help and got off the juice after the standout season and now his body is breaking down. (see Brady Anderson). I don’t think he was on anything personally. But that he did lose his confidence and saw his ice time, and more importantly, his time on the powerplay decrease every season by up and coming players like Ryan Clowe, Devin Setoguchi, Milan Michalek and Joe Pavelski. His performance enhancer was Joe Thornton, and he lost that. After a brutal season last year, Cheechoo is turning a page in 2010, playing well for the San Jose Sharks farm team and averaging over a point per game. Maybe he will get a call up and a chance to show everyone that the fire is still inside him to play in the NHL. In my mind there is no reason he couldn’t be a 20 plus goal guy again.I can see him now cruising in his car listening to that Nelly song “Just A Dream”, missing Joe Thorntons sweet playmaking skills. “I was thinkin about Joe, passing to me. Will I make it back? No one knows. I realize, yeah, it was only just a dream"
"I was thinkin about Joe, passing to me. Thinkin about us, what we gonna be?" One knee injury essentially ended his career. Cheechoo generated much of his offence based on his speed. When he was no longer able to cut behind defencemen and go to the net with the puck, he was no longer a goal scorer. All the performance-enhancing drugs in the world wouldn’t make this guy score 50 goals again on that knee of his. Then, Murray foolishly got suckered into taking him back in the Heatley deal. He’ll make $1 million off the Senators next year if I’m not mistaken. I would love to see cheechoo in a leafs uniform. It can hurt, considering clarke macarther is the leafs leading point getter.